Our implementation of the FBI's Wavelet Scalar Quantization is fully FBI Certified for Windows XP, Windows 2000, Windows Server 2003, Windows Server 2008 and Windows Vista, compliant to the latest 3.1 specification, and gives developers the power to use one of the worlds fastest WSQ Encoder/Decoders on the market today. Our latest release is fully thread safe which will enable the most demanding multi-threading applications to be realized. The FBI's Integrated Automated Fingerprint Identification System (IAFIS) is part of a project to design and implement a national standard for the collecting, encoding storing, and retrieving digitized fingerprint images. It is a requirement that fingerprints submitted to the FBI conform to their strict standards. Most lossy compression methods, such as JPEG, discard the smallest (highest frequency) details in images, and at these higher compression ratios unacceptable distortions are introduced into the image. Contained within fingerprints are tiny details that are considered admissible points of identification in a court of law. 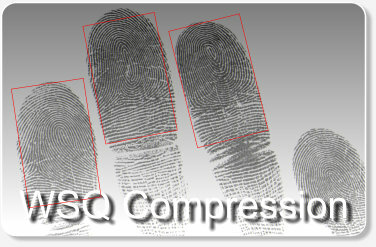 Compressing a fingerprint image using JPEG may remove these fine details regarding them as noise, blocking artefact's may also be introduced at compression ratios above 10:1. WSQ Viewer is a free tool built using our WSQ Library, please visit the WSQ Viewer page for more details.